Part of what makes Macau such a great place to explore on foot are the small alleyways and side streets, many of them not even named in the larger general maps. Many of these streets can be mere steps away from the main areas such as Senado Square and its throngs of tourists. The difference is astounding, with a deep blanket of silence laid over the small back streets and, together with the period architecture, a feeling that time has somehow slipped or traveled past us. 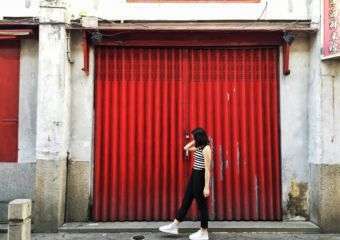 When it comes to naming these streets and alleys, it is interesting to spot the similarities and differences between the Portuguese and Chinese names. Travessa da Paixão, for instance, has an interesting background. Dating back to 1925, the use of “passion” in Portuguese referred to the death and resurrection of Christ. 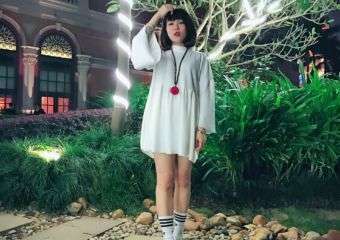 However, its Chinese name, 戀愛巷, refers to passion and romance, hence the frequent presence of grooms and newlyweds taking photos. This street is no more than 30 meters long and extends from the Ruins of St. Paul’s to Rua da Ressurreição. The Ruins of St. Paul’s are accessible through the latter, where a door existed in a wall-like construction which enclosed the whole area managed by the Jesuits, back in the 17th century. Nowadays, there is no wall and Travessa da Paixão is not connected to the ruins, although it is equipped with a set of stairs leading to that area. In the 1980s, this alley was probably one of the best places to takes photos of the ruins, since one could easily see the whole structure. Nowadays, the building has been enlarged and the monument is barely visible from this street. Need another reason to visit the neighborhood? Travessa da Paixão now is home to Cinematheque-Passion, a totally renovated building including a movie screening room and storage of local videos. The cinema supports local appreciation of the arts and regularly showcases independent film projects. 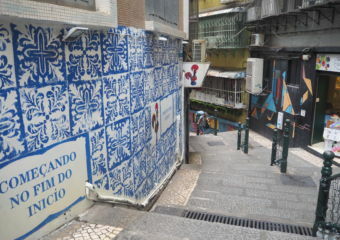 Walk down Travessa da Paixao, turn left on Rua da Ressurreição, and then on the right is the stairway leading down into Calçada do Amparo, more of Macau’s “secret world”, with interesting shops, eateries, and art exhibits. The whole neighborhood is only steps away from the crowded streets surrounding Senado Square. So the next time you find yourself in the city center surrounded by people, take a step in a new direction and explore some of the hidden streets and back alleyways. A different world awaits you!